The museum introduces the fascinating details and the history of the Kishu lacquerware which has a history of 600 years. At the entrance, you will be welcomed by a large lacquered Hina doll couple. Inside you can enjoy shopping lacquerware and panel exhibitions on manufacturing processes of various lacquerware. 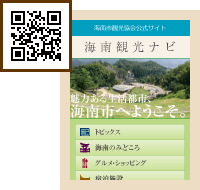 Also, you can experience making golden lacquer-(makie) in this museum- (reservation required). Copyright©2011 Kainan city all rights reserved.